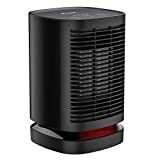 Benuo - 950W Portable Electric: Space Heater • The Air Geeks, reviews of air conditioners, dehumidifiers and air purifiers. Winter is no fun (unless you’re skiing). So, if you don’t want to curl up on the sofa, covered in blankets, wishing there was a cheaper option to the main heater in your house, we have some portable space heaters that we think might help you get past the cold winter months. We’ve come across the Benuo Electric PTC Ceramic Space Heater that has been attracting a following and we hope that this guide, detailing its features, pros, and cons, will help you make a smart decision. Just because the winter is here, or near, doesn’t mean we can’t still have fun! At first glance, you will notice that the Benuo Ceramic Space Heater is a small space heater that can be lifted and relocated with ease. In fact, the whole appliance only weighs about 3 pounds which is very light compared to many other similar space heaters. It occupies a meager 7 inches in space and is only 9 inches high. This makes it suitable for placement on your desk or under the desk if you need to keep your feet warm. It doesn’t have a handle but considering its weight, there shouldn’t be a problem carrying it. This heater is not the best when it comes to noise as the noise emitted can be a bother and nuisance to some people. The 58 dB of noise produced by this device can overwhelm conversations and clicks can be heard as the appliance adjusts itself during oscillations. However, it comes armed with multiple safety protection features. One of these is the tilt switch located at the bottom of the appliance. If by accident, someone or an object knocks the heater and topples it, the tilt detection switch automatically turns off the appliance. This switch only works for flat and hard surfaces. The appliance might not turn on when placed on carpets or fluffy materials. A common workaround is to find a small piece of cardboard to place the appliance on before placing it on the floor. Another handy safety feature is the overheat protection that cuts off the power in the event the heat exceeds 90F. This is very possible especially during a power surge or overload on the appliance which could damage to the internal components or cause fires. This heater comes with a 2 heat level setting and a fan mode. The high-level setting uses about 950W while the lower heat mode operates at 700W. The fan operates at a mere 5W. Some people have complained that the fan speed on the fan-mode is very slow and little air is moved. The high setting mode is able to provide you with the proper warmth you need in your room though with a loud fan blower sound. Notably, it is not suitable for large living room spaces as it is designed for small spaces such as small garages and office spaces. The PTC Ceramic heating technology is able to heat the appliance in less than 3 seconds and this means that its warmth will be felt a lot faster than in other small appliances. A tap on the swing button will result in 90 degrees oscillations with 45 degrees left and right. This is meant to ensure even distribution of heat energy to different parts of the room. The control panel consists of only 3 buttons; the swing button, the mode button, and the on-off button. There is no display or an analog thermostat to configure own precise temperature measurements. Color indications are used to show different modes(red = heat) (blue = fan). Users are stuck with the only 3 available modes to set the heat output. No tactile feedback:The buttons don't have any tactile feedback so it's hard to know if you pushed the right buttons at time. I had bought this for my tent. In the midwest, cooler temps are setting in already. I still enjoy hiking camping in the fall but the nights get pretty cool. So this heater does a wonderful job of heating the tent up and keeping my toasty at night. It would be perfect for an anyone that needs something small and warm." This heater came a day early so that’s always nice when buying a product. It was a bit smaller than I imagined but for how to enjoy it is it packs a punch in the heat department. Even when I don’t need a heater it is a pretty good fan! Overall a bit pricey but the quality is good." Overall, the Benuo Electric PTC Ceramic Space Heater is a decent heater for the price especially if you need a source of heat while camping or to warm your feet in the office. However, if you are the contemporary type and want things that are modern and have good user experience, this one will likely disappoint. This appliance is very limited in functionality because you can’t set your preferred temperatures through a thermostat. However, it is good for traveling or camping as it is very portable and can be carried in a travel bag without taking up too much space. If you are down financially and need a quick solution over the winter this would be a nice candidate if you can handle all the limitations mentioned above.